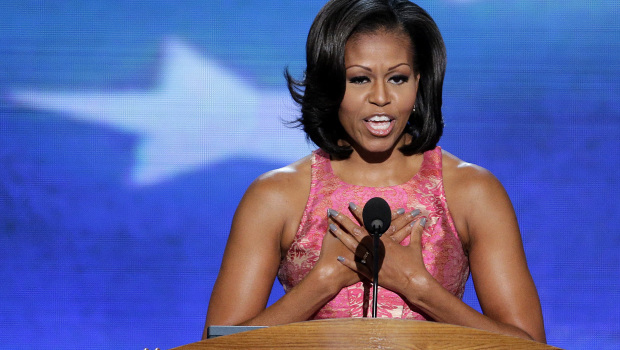 This entry was posted in Celebrity, Current Events, Family, Fashion and tagged blue nails, dnc, michelle obama, mmi by Liz K.. Bookmark the permalink. Looked blue some angles – looked gray other angles – remember too from the front she was in extremely strong white lighting and the wall behind her was flooded in blue lighting – in the intro speaker before Ms Obama, the stage was shown in the red/white flag backing. 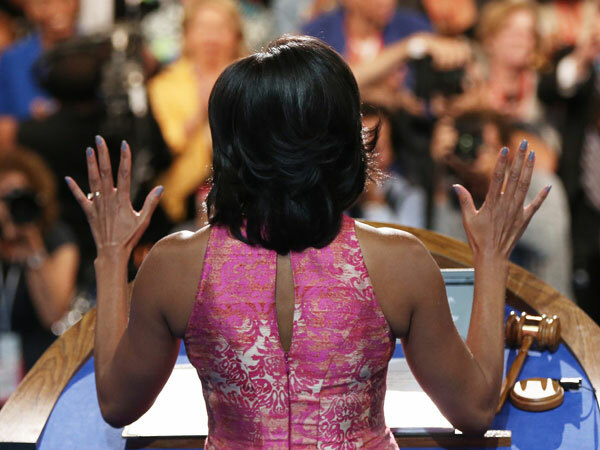 The blue wall behind Ms Obama helps make her dress pull more magenta. I think the idea was to match close to the bottom of her dress that appeared gray/blue but again hard to tell with the lighting. Hopefully they have some statement to what the polish shade was out of the First’s Lady’s office soon. I had a guess it might be China Glaze Elephant Walk.